We wish to say a big thank you to the good people of Husthwaite for the generous support given to our charity, The Dragonfly Schools Foundation, on Sunday 18th June, when Husthwaite residents, like those in many towns and villages nationwide, gathered for their Great Get Together, in honour of the late Jo Cox MP. We are most grateful to everyone who approached us and showed such interest in the work of The Dragonfly Schools Foundation, a fledgling charity which we established in 2016 to provide free education and vocational training to transform the lives of some of India's most forgotten children. Living vulnerable lives in the streets, markets and railway stations, often begging or carrying out hard or dangerous work for very little reward, these children are caught in a cycle of poverty and neglect. 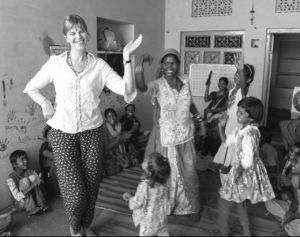 On this most enjoyable day, your collection raised a wonderful £300 in support of our work in Rajasthan, North West India. We currently provide teaching resources and pay the salaries of two teachers at a small free school for the children from the desert camps around the town of Pushkar in central Rajasthan. This year will see the launch of our first apprenticeships and mobile ‘pop-up' schools in Pushkar and the nearby city of Ajmer. In the meantime, our plans for a free school in Ajmer are moving forward apace. We have now located some available premises in Ajmer, which are just perfect for a school and, in September, when we return to Rajasthan, we are meeting with the owners to negotiate its rental. If all goes well, we would hope to open our doors in the Spring of 2018. With schools, both here and in India, offering their help and support, we hope our charity will bring children living very different lives, in very different communities and cultures, closer together.